Dried bonito flakes – the unsung hero of Japanese cooking. These light flakes are combined with kelp to make dashi, the clear soup stock that is essential to so many recipes. 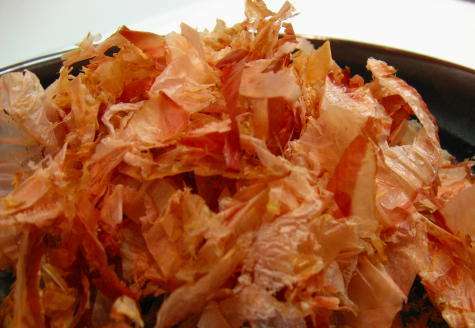 Dried bonito flakes are made from the Skipjack tuna or Katsuo. These fast moving species of tuna are found around the coastal waters, mainly on the pacific side, of Japan. Fresh fish is gutted, trimmed and gently boiled in salt water to remove the skin. The fish are then hot smoked. The final result will infuse depth and complexity yielding smokey yet fragrant flavors into your stock. 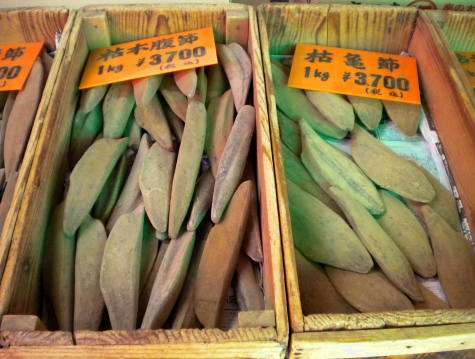 For special occasions you can buy whole, wood-like fillets and freshly shave them yourself. But more commonly, it is sold pre-shaved varying according to quality, thickness and cut (darker meat, lighter meat). In addition to its use in dashi, shaved bonito flakes are also used as a garnish (e.g. cold tofu), mixed into furikake (a topping for rice) and is also mixed with soy sauce to make onigiri (rice balls). You can purchase bonito flakes at most Asian food stores. I’ve even seen it at Whole Foods, but it’s quite pricey there.